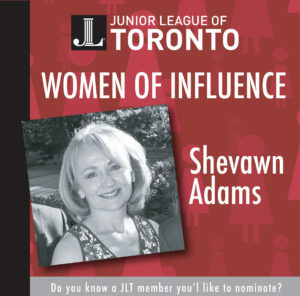 Shevawn joined the Junior League of Dallas in 1994. She is a Past Chair of Start2Finish – still very involved with that organization. Prior to that she was very involved with the construction of The Rose Cherry Home for Kids (now Darling Home for Kids) – a respite for seriously ill children. She is the owner of Inner Dimension Design – and is an ARIDO designer – balancing a career and family (has 3 children). 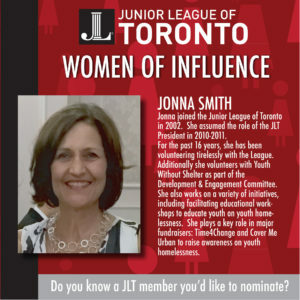 Jonna joined the Junior League of Toronto in 2002. 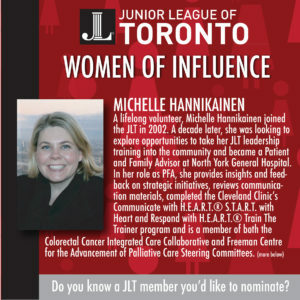 She assumed the role of the JLT President in 2010-2011. For the past 16 years, she has been volunteering tirelessly with the League. Additionally she volunteers with Youth Without Shelter as part of the Development & Engagement Committee. She also works on a variety of initiatives, including facilitating educational workshops to educate youth on youth homelessness. She plays a key role in major fundraisers: Time4Change and Cover Me Urban to raise awareness on youth homelessness. 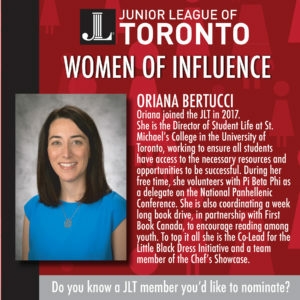 Oriana joined the JLT in 2017. She is the Director of Student Life at St. Michael’s College in the University of Toronto, working to ensure all students have access to the necessary resources and opportunities to be successful. During her free time, she volunteers with Pi Beta Phi as a delegate on the National Panhellenic Conference. She is also coordinating a week long book drive, in partnership with First Book Canada, to encourage reading among youth. To top it all she is the Co-Lead for the Little Black Dress Initiative and a team member of the Chef’s Showcase. To Michelle, Palliative Care is care for the body, mind and spirit of both the patient and their family and she hopes to help change the conversation surrounding palliative care from only being end of life care to one of compassionate care throughout all stages of a life-limiting illness. 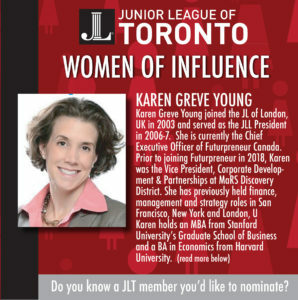 Karen joined the Junior League of London, UK in 2003 and served as the JLL President in 2006-7. Karen is an accomplished non-profit leader dedicated to fostering economic and social prosperity through new approaches and partnerships. She is currently the Chief Executive Officer of Futurpreneur Canada, Canada’s only national organization dedicated to supporting young entrepreneurs. Futurpreneur’s unique model combines funding, mentorship and resources to fuel the success of thousands of young entrepreneurs in every Canadian province and territory. Prior to joining Futurpreneur in 2018, Karen was the Vice President, Corporate Development & Partnerships at MaRS Discovery District, a global innovation hub based in Toronto. She has previously held finance, management and strategy roles in San Francisco, New York and London, UK, at organizations including Bain & Company, Gap Inc. and the UK’s Institute of Cancer Research. Along the way, she co-authored a book with her mother about their shared experience through her mother’s ovarian cancer journey. Karen holds an MBA from Stanford University’s Graduate School of Business and a BA in Economics from Harvard University. 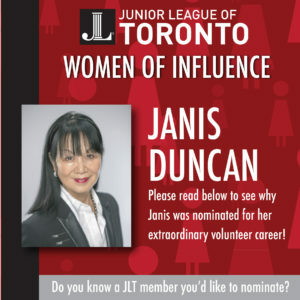 Janis Duncan is the founder of “More than an Occasion” which focuses on fostering engaged and inclusive corporate cultures for women by empowering organizations through team building activities, client appreciation events and professional development programs. Prior to starting MTAO in 2014, Janis was a Vice President and member of the Presidents Round Table and recipient of the Award of Excellence at Cushman & Wakefield Ltd.
Janis was the co-founder and former chair person of Gateway Canada – Cushman & Wakefield Ltd’s national women’s organization; a member of the Board of Directors (Governance and Revenue Generation Committee) of Trails Youth Initiatives; the senior event lead for women’s professional development events with Lean In Canada; a volunteer at Ronald McDonald House; a past member of the training committee, management team and current member of the membership team working on the mentoring program with Junior League of Toronto and recipient of its Joan Crocker Community and Civic Leadership Award; and, an inaugural board member and past president, membership director, secretary, member of the leadership committee and current member of the program committee with Toronto CREW (commercial real estate women) and recipient of its Engagement and Volunteer Award. 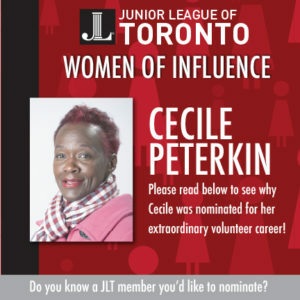 Cecile, a past-President of the Junior League of Toronto, has been a leader with the Black Coalition for AIDS Prevention to help reduce the spread of HIV infection within Toronto’s Black communities. Cecile has held many leadership positions including Board Vice-Chair, Board Recruiter, Governance Committee, Fund Development, Chair. She has been part of the Board of Directors and Corporate Donors for Shakespeare in the Ruff to help revive outdoor theatre in diverse neighbourhoods in Toronto East End. Cecile also volunteers as part of the orientation and training of new volunteers for the Children’s Aid Society of Toronto.